CHICAGO, Nov. 20 (Xinhua) -- Kirk Baumann just returned from a week-long trip to China, and is already planning his next trip back. "I like Chinese food. Now I'm on a diet for the next trip," Kirk told Xinhua. Working first for Board of Wisconsin Ginseng and later Baumann Ginseng, Kirk has visited China several times since 2002 to promote ginseng from the U.S. state of Wisconsin, where his younger brother, Kraig, runs the biggest ginseng farm. "We produced about 200,000 pounds (91,000 kg) (ginseng) and exported 180,000 pounds to our customers in China last year," Kirk told Xinhua. Thinking of this year's production, Kirk said, "It looks like we will be able to sell all our products into China. We are just getting the large pharmaceutical chains into the American ginseng, so that'll be more of an opportunity." Jiang Mingtao, also a ginseng grower in Wisconsin, launched Marathon Ginseng International Inc. in 2010, and targeted the Chinese market from the beginning. By 2015, the company had exported half of its production to China. "We entered Chinese market in 2012, began to sell ginseng on Shanghai SMG-CJ Homeshopping platform in 2015, opened a sub-company in Beijing in May this year, and plan to open another sub-company in Chongqing Free Trade Zone in the near future," Jiang told Xinhua. Jiang attended the first China International Import Expo held in Shanghai in early November, where he displayed ginseng cosmetics, ginseng liquor, ginseng extract tonics and more. "I got acquainted with many (Chinese) businesses and clients, and they for the first time had a taste of Wisconsin ginseng. We signed letters of intent on cooperation," said Jiang with satisfaction. Jiang found huge opportunities in the Chinese market, with the state's ginseng enjoying a solid reputation in China. In 2017, the state exported 14 million U.S. dollars of ginseng to China alone, up more than 16 percent from 2016. The total value of U.S. ginseng exports was roughly 30 million dollars in 2017, and China was the biggest buyer. Ginseng is not the only sector of the U.S. state that is seeking out the Chinese market. 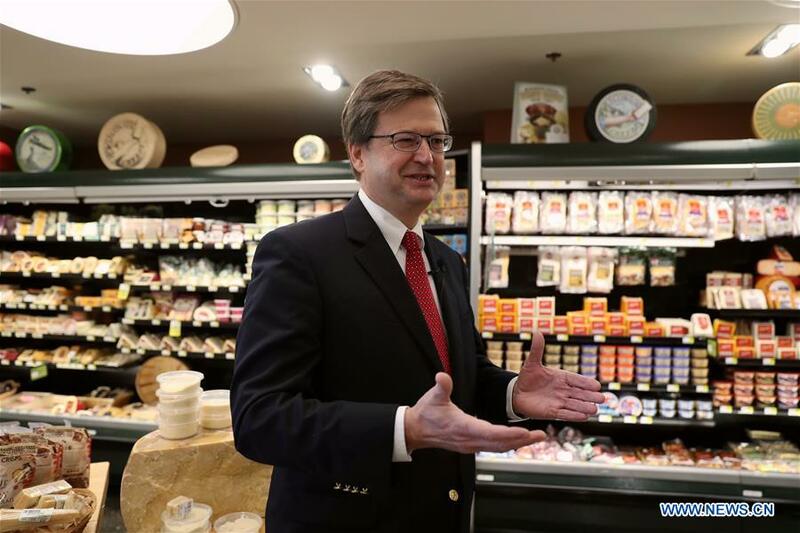 Sartori Cheese, a family-run company based in Plymouth in the eastern part of Wisconsin, has beaten others in bringing its cheese, a combination of European traditions and Wisconsin features, to Chinese consumers. "I sincerely hope that the Chinese consumers try our cheeses ... We have a variety of cases for them to explore," said Pam Hodgson, 56, one of the only two females among the 58 certified master cheesemakers in the state known as "America's Diaryland." Wisconsin produces more than 600 varieties and makes 27 percent of the nation's cheese. In 2017, the state produced 3.37 billion pounds (about 1.5 million tons) of cheese, but only exported 2 to 3 percent of it. "Most of our cheeses are sold in the United States ... But we're growing and the opportunity to sell into China and other markets is growing," said John Umhoefer, president of Cheesemakers Association Wisconsin. Chinese people are becoming more receptive and interested in the different flavors of the world, said Umhoefer. "I think they will want to move beyond a pizza and a hamburger from America and taste the special cheeses, (and other) special foods from this country." The state's dairy exports to China grew 70 percent in 2017, according to statistics from the Wisconsin Department of Agriculture. Wisconsin exported 1.9 billion dollars' worth of goods to China last year. China is the state's third largest foreign market, after Canada and Mexico. In 2016, Wisconsin exported 491 million dollars' worth of services to the Asian country. Wisconsin's exports to China supported 14,100 American jobs in 2016. The growth of the state's goods exports to China from 2008 to 2017 stood at 35 percent, and that of services exports to China from 2007 to 2016 amounted to 417 percent, according to statistics from the U.S.-China Business Council. Another dairy company, W.D. Hoard & Sons, based in Fort Atkinson, Wisconsin, is exporting "editorial content" rather than dairy products to China, said Brian V. Knox, president of the company, referring to Hoard's Dairyman magazine. Launched in 1885 by the family-owned farm, the magazine debuted its Chinese issue on July 17 this year to provide fact-based insight on dairy research and practical farm solutions to China's dairy industry. "We're constantly seeking new domestic and international markets for our high-quality products," said Kaitlyn Riley, the 2018 Alice in Dairyland, a program selecting a young woman annually as Wisconsin's ambassador for agriculture. "It would be good to meet with the people who help our agriculture industry thrive and whom we work so hard to provide those products for," she said.